Seaford was historically a thriving south coast harbour town and formerly a member of the Cinque Ports, but it was stripped of its status after a natural disaster destroyed most of the original harbour. Today it is still a bustling seaside town with coastal views and an attractive pebble beach, and its seafaring prowess is commemorated in the Martello Tower Museum and Crypt Art Gallery. With the refreshing sea air and multitude of coastal walks to enjoy, Seaford is an invigorating place to be and lovely spot for gathering together your nearest and dearest to celebrate a special occasion. Whatever the occasion, whether it be a major milestone in your life or an informal party, the Hog Roast Seaford team can provide you with the perfect menu for your big day. We are the leading local experts in hog roast catering and we can supply everything from slow-roasted pork sandwiches for a large outdoor event, to a formal meal with several courses and canapes. Our meat is of the highest quality and is cooked by extremely experienced Chefs using our own robust and versatile hog roast equipment to produce an unrivalled level of succulence and depth of flavour. We can also provide alternative meats such as sirloin of beef, spring lamb and organic chicken, all prepared using the same slow-roasting method with equally delicious results. If you have vegetarian guests and think hiring a hog roast company would not be appropriate, think again. Hog Roast Seaford have the vision and creativity to offer menus that suit all palettes and dietary requirements and we always receive incredibly positive feedback about the quality of our vegetarian options. We believe that food should bring people together, not set them apart, which is why we always go the extra mile to accommodate everyone when we are designing our menus. 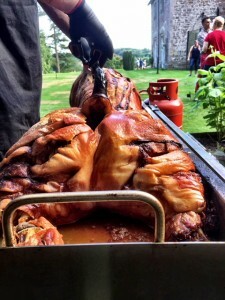 If you need a catering company who can provide a varied menu that will please all of your guests, is committed to providing quality ingredients and has the flexibility to cook in any location so you can make the most of Seaford’s stunning coastal views, the Hog Roast Seaford team are the ideal catering option for any type of event in the area.